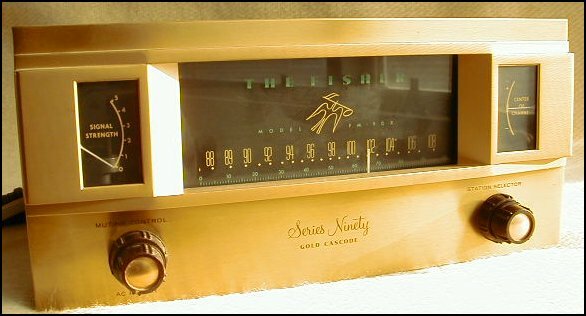 The first FM tuners were mono tube units, built after World War II when the American 88-108 MHz FM frequency band was established. We will concentrate on the best performing, and then most popular tube units that in general are still available on eBay. 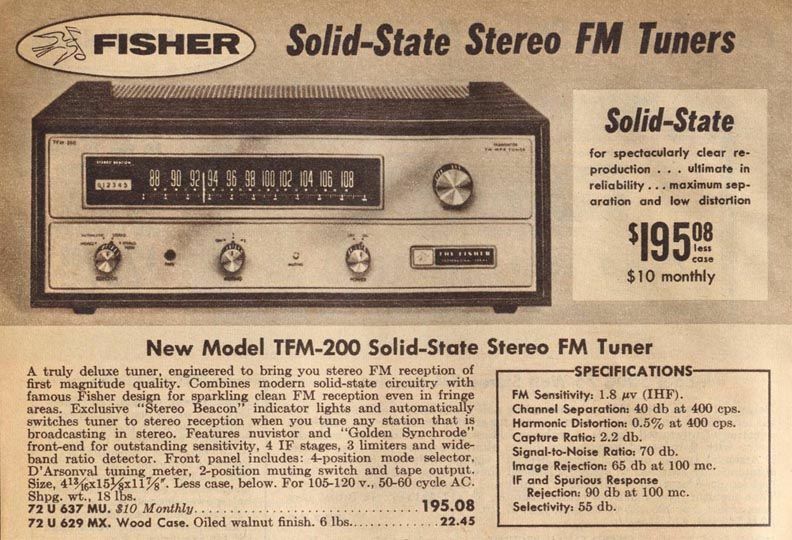 All FM tuners were mono until the stereo standard was approved in the early '60s. Mono tuners can be converted to stereo by using external MPX adapters, which were made for a brief period by most tuner manufacturers in the early '60s. The following is a listing of the significant tuners of the golden time period for tube tuners, the 10 years from about 1955 to 1965. We will be adding more information on these tuners and others over time. Our panelist Bob has begun working on aligning some of his tube tuners. Bob comments, "With tube tuners, the alignment and tube wear have a tremendous effect on how the tuner works and sounds. The good news is that many tube units are actually pretty sensitive, i.e., give up very little to newer tuners, provided that there is no problem with adjacent or alternate channel interference. This is certainly a surprise to me, but measurements bear it out. The worst problem they all have is selectivity, beyond the obvious maintenance issues." Here are links to some of the many websites that have information on the FM-3. Our panelist Bob reports: "I just finished working on a Dynaco FM-3 that was sent to me in '?' condition, meaning who knows what shape it's in. It was missing the rectifier, so after finding one in my new tube stock, I popped it in and took a listen. Not bad, but something was amiss. I went through the whole unit and found a couple of problems. The RF stage inductor was bottomed out in the coil. The unit was obviously out of alignment. I removed and fixed the inductor, which made a big difference in sensitivity. For alignment, first I coupled 75 kHz modulated 10.7 MHz into the mixer, and peaked all the IF transformers top and bottom. I peaked the detector T-X top and bottom as well, then went through the process again. It was apparent that there was something funny going on, as there was an occasional sudden shift in sensitivity when adjusting the transformers. I thought it was either poor solder connections to the PC board, or IF T-X embedded cap problems. See the article by Daniel Schoo, 'Repairing Intermediate Frequency Transformers,' here for more on that. Distortion, 100% modulation, 1 kHz: 0.28%. Sensitivity (75 ohms through 75/300-ohm balun): 2 µV. Frequency response - done with random noise and 100 averages, using two- channel magnitude and phase true frequency response function (source in channel 1, response in channel 2), with Panasonic VP-8122A FM generator set to 75 µS pre-emphasis: -3 dB at 10 kHz, -5 dB at 15 kHz. Separation at 1 kHz: 28 dB. 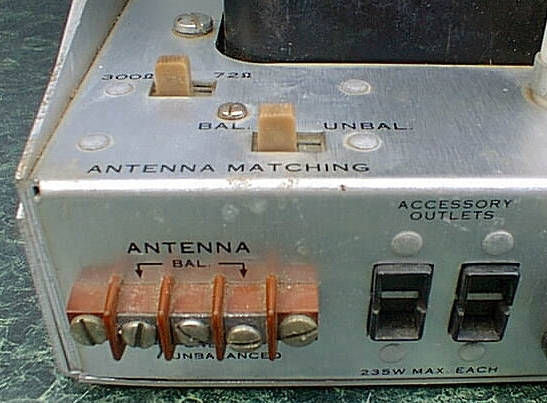 Selectivity was typical for a tube unit, meaning forget about adjacents to strong stations without a rotating antenna, but alternate stations to strong ones were possible with care in tuning. Again, a rotator helps significantly. The sound was good, and with some music the well-documented high-end rolloff was not too bad. The bass was fairly deep, but with a slight tubby character. Mids were excellent, and the sound on strong stations was very quiet in stereo, with no hum or noise audible. Overall, I was moderately impressed with the aligned FM-3. It certainly will deliver the 'tube sound' people like, with good sensitivity. My unit had the original tubes, which were left in place and not tested yet. That will be done next, with a touch-up to the alignment if I find any bad ones." A detailed description and great photos of the mods to our contributor Mike B. 's FM-3 can be seen here. The "Fisher Doctor" website is the place to go for Fisher information and photos, but several trustworthy people in our FMtuners group claim that Al is unreliable. We urge anyone considering doing any sort of business with him (including buying a manual) to read this thread on Audio Asylum before doing so. Our contributor Larry has an extensively modified FM-90-X which "sounds fabulous in mono - liquid, smooth, yet still detailed and with musical (but not authoritative) bass. This tuner has a very simple gain stage with a cathode follower, reported in many circles as being deleterious to the sound, but I find with good tubes and the mods it sounds great." Our contributor John Byrns comments on the FM-1000 and the FMR-1: "I understand the two are virtually identical, with the FMR-1 having a rack mount panel, optional crystal controlled front end, and possibly a different audio output stage to drive the optional 600-ohm audio line transformers that hang on the back like a pair of wall warts. The two tuners are said to have identical RF, IF, Detector, and stereo multiplex circuits, the audio line output stage may or may not be the same." Our panelist Bob notes that the TFM-1000 had an FET front end, counter detector type demodulator, and good specs, including a capture ratio of .6 dB. 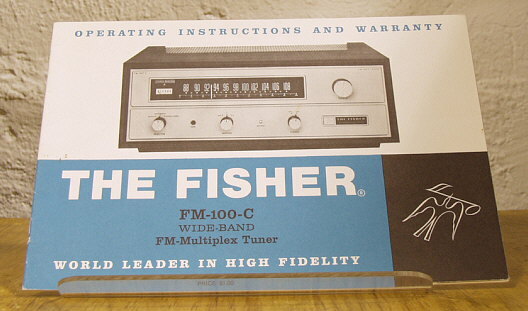 Our contributor Ray D. has a Fisher FM-100T preamp-tuner: "The interesting feature is that it was designed for simulcast stereo with one channel on AM and the other on FM. To accomplish this it has two separate tuning dials and an AM-FM output option. As is it is only a mono FM tuner with MPX option. Now this AM-FM feature would be a useless anachronism except that at the time I acquired it, the CBC would broadcast the news at the top of the hour on AM and FM. So I tuned in both and was probably one of the last people who actually used the AM-FM setting for something resembling what it had been designed for. The slight time delay between the AM and FM broadcasts just added an extra "spacial expansion" effect! I was VERY shocked to see one go for $510 on eBay (12/08). Was this just insanity, or is there something really valuable about this old piece?" We don't have any first-hand knowledge of any of the Trough-Line tuners, but a few members of our Yahoo FMtuners group believe that the sound quality of these British tuners make them worthy of mention. Read the posts beginning here, up to and especially here, for more information, but read the cautionary note here as well. See the main tuner review section for information on the legendary 10B and its descendants, which may be better buys. Our panelist Bob reports on the MR 65 and its relatives: "I just finished an alignment of a beautiful MR 65 and was really pleased with the results. I was really surprised to see that this tuner had 4 gangs, unlike 99% percent of tube tuners that only had three. There are two gangs after the antenna input. Actually, it is the same setup as the MR 66, the AM-FM model. The MR 65 has station-pulling ability just about as good as a decent 4-gang solid-state tuner, and maybe better than some. It passed my 94.3/94.5 adjacent channel test with flying colors. The sound quality stock needs some work - it's not bad, but the old coupling caps need updating to deliver the goods. Overall, a pleasant surprise. These go pretty cheap for McIntoshes, so I give it a 'good buy' rating. I paid $300 for a piece with some cosmetic problems that needed cleaning and alignment. But it has an MPX circuit installed, which was optional. The MR 65B is similar in looks and function, but adds a front-panel stereo light, uses a 6DS4 Nuvistor instead of the 6BN4A for the RF amp, and uses a solid-state rectifier. The follow-on MR 67 is also similar in circuit function, but has a different front panel and meter setup, and drops back to a 3-gang front end." 1. The MR 71 has a 4-gang front end, while the MR 67 has a 3-gang front end. I don't expect that this difference would have any effect on the sonic attributes of either tuner. 2. The MR 71 has an additional IF stage, giving it a total of three IF stages to the MR 67's two IF stages. The additional IF stage adds 2 (4) more poles to the IF filtering, which may result in a narrower IF response depending on the bandwidth of the remaining IF filters relative to those in the MR 67. The additional IF amplifier and filtering could impact the sound of the tuner, perhaps negatively at high signal levels, while perhaps offering better sound under more difficult reception conditions. 3. The MR 67 uses a simple signal strength operated squelch, while the MR 71 uses a more complex noise activated squelch which has its own dedicated discriminator. This shouldn't have any impact on the relative sound of the two tuners. 4. The multiplex decoder circuits appear to be identical in the two tuners, but they may use different "SCA" filters. The MR 67 filter is shown as discrete components in the schematic, while the "SCA" filter in the MR 71 is shown as a "black box" module, which may have a different filter topology, along with different phase and amplitude response. If the "SCA" filters are different, this would impact the sound quality, although it is impossible to say which might be better without knowing more about the two filters. 5. The audio output stages in both tuners appear to be virtually identical, except for the details of how the negative feedback from the second plate circuit back to the first cathode is arranged. The output jacks are also connected differently to the second plate circuits, which is tied in with the feedback change. These changes, minor as they seem, could have a significant impact on the sonics of the two tuners." Check this post in our FMtuners group to read about how to tune up an MR 67. 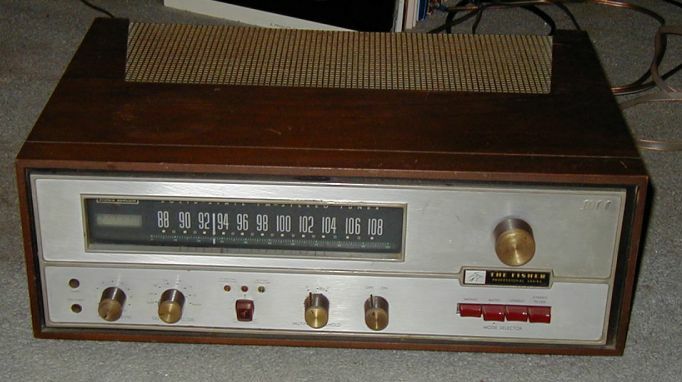 Our contributor Bill Ammons reports: "I picked up a Pilot T601 FM tuner. It's 1947/1948 vintage with 5 tubes. It's only about 8 inches square in a cute little walnut veneer case. After cleaning and tuning it up, it sounds great. Noise is about 55 dB down with about 1.5% distortion. It's a 3-gang super-het design that feeds either unbalanced deemphasized audio or roughly RIAA equalized (no de-emphasis) audio to a phono input. Just for fun I am going to run a frequency response/noise run on this one - the darn thing sounds good with tight bass!" Thanks to Paul Baptista for this scan of Pilot's 1962 catalog. Our panelist Bob reports: "I had one of these on hand for a while. It is a very interesting design. I believe I remember others saying it was built more like a military communication receiver than typical commercial FM tuners. You can see this in the inclusion of a front panel continuously variable knob to adjust the RF gain in the front end, which I have never, ever seen on any other FM tuner. But it works - crank it up for weak stations, down for strong ones. What really stands out is the unusual limiter stage. I think this may actually be what gives the Precedent the sound people like. The detector on an FM tuner is sensitive (to varying degrees depending on the design) to AM, or amplitude modulation. It is the limiter's job to remove all forms of AM before the signal hits the detector. In the REL, the limiter uses something like 5 tubes and transformers. Most tuners have one or maybe two. And this is not a case of double-counting as Fisher used to do. In addition to these, there are another 4 or 5 IF transformers and IF amp tubes. 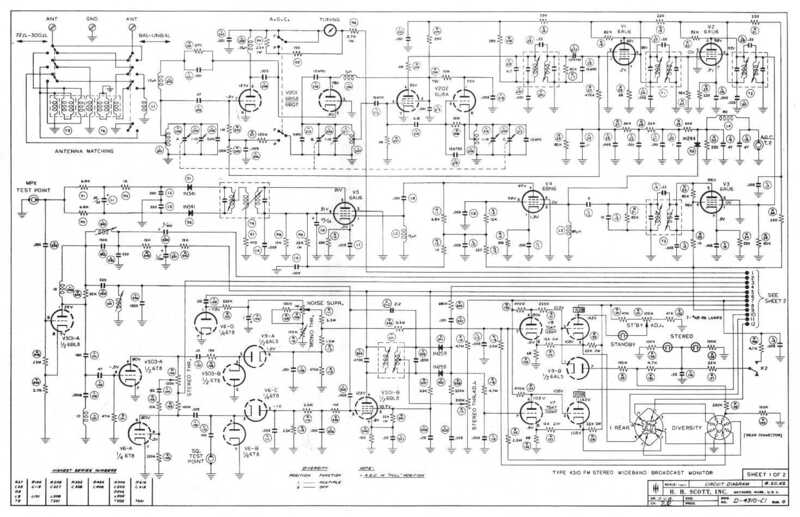 It is the longest and most complex limiter design I have seen yet in a tuner. The Precedent also has a unique RF front end: instead of varying the capacitance to tune stations (as every other tuner I ever saw does), it varies the inductance - plungers move in and out of wound coils, all driven by a little chain from the tuning knob! I also liked the sound, as played through a Scott 335 MPX adapter." Bob adds, "I believe the REL was designed for commercial use as an FM radio relay receiver, or broadcast monitor. Much the same as the Rohde & Schwarz units." Our contributor Chris says, "Wow--two RF amps, then 5 IF amps, three 'pre-limiters' and two limiters. The engineers must have locked the bean-counters in the basement when they were designing that one." 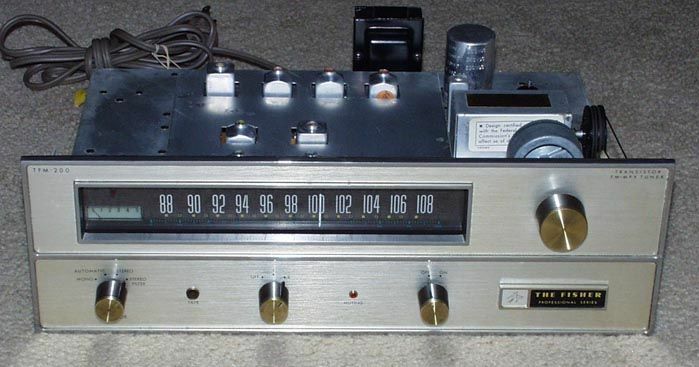 Our contributor Bob S. adds, "The Precedent is probably the ultimate DX tuner. This is probably the only 5-gang tube tuner. What's really cool is the fact that with variable inductance, it is possible to maintain constant bandwidth from 88 to 208 MHz. With variable capacitance, the bandwidth will be about 30% wider at the low end of the band than that at the high end. It also has a cascode triode front end, about the best configuration for stability, and good noise figure in its day. This in combination with the 180 kHz (6 dB) bandwidth should make it a killer DX machine. The tubes only cost about $4 on average (today's prices) and are quite commonplace. It won't be a good stereo tuner; the narrow IF would really make the stereo subcarrier take a dive." A knowledgeable contributor to Antique Radio Forums named Al Germond posted the following (slightly edited here), which partially overlaps and corroborates what we already had on TIC. We normally post only original content but have to make an exception here: "The REL 646 was available as a rack-mounted version though seen more commonly in the metal case. Three versions are shown in the factory service manual. 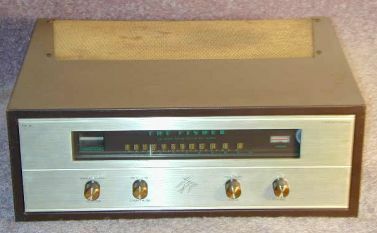 The 646-B was a complete AC-operated receiver with a 10-watt push-pull output stage. 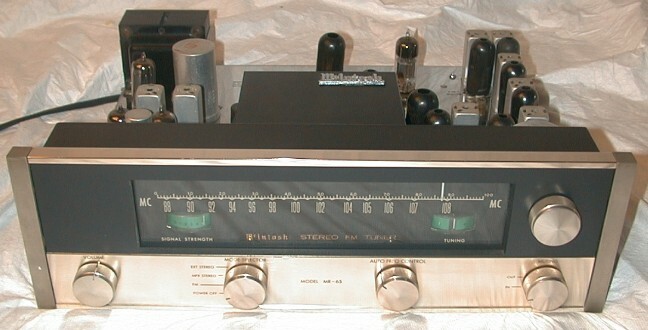 The 647-B was a tuner designed to operate into a 600-ohm load. The 648-B was a field/mobile 6-volt receiver requiring a separate B-voltage supply offering an audio output of 4 watts into a 6-ohm load. "The 646 series was REL's post-war successor to the pre-war [1939-41] type 517-A, a two-dial 42-50 mc superheterodyne that did not have ganged tuning but strictly followed Armstrong's circuitry as REL was one of his original licensees (General Electric and Stromberg-Carlson were among his others). There were several iterations of the 646 series. The first units manufactured through 1948 covered both the prewar band (my unit covers 44-50 mc, curiously omitting 42-44 mc) and the present 100-channel 88.1-107.9 megacycle band. After much debate and contentiousness between the FCC vs. Armstrong and his followers relative to retaining a portion of the old 45-megacycle band for relay purposes, the Commission ordered the closure of all low-band facilities by December 31, 1948. Thus, later versions of the 646 series covered only the 88-108 mc band and the REL's lower dial scale substituted channel numbers (201-300) for the 44-50 megacycle calibration. 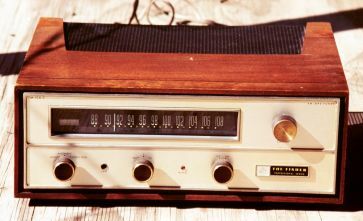 "The 646-B remains an excellent FM tuner/receiver in what could be described as a 'supertuner' of its day, but it wasn't the only one. A firm even more obscure than Long Island-based REL -- Harvey Radio Labs of Cambridge, Mass. -- manufactured a limited number of model 193-R FM monitor receivers which outclass as well as outweigh the much-touted 646 series. The 646-B is quite sensitive and has a smooth tuning 'feel' across the dial. It's only moderately selective but the two meters (signal strength and center-channel tuning) are a classy touch. Of course, I would strongly recommend replacing every bypass capacitor. "In 1950-51, REL took out small trade publication ads to announce the final 646 production run though with plans for a successor that turned out to be the Precedent or model 646-C. When the much-anticipated Precedent finally appeared in 1954, it wasn't too long after Armstrong's suicide and the closure of his station, KE2XCC (93.1 mc/Alpine, NJ) on March 5, 1954 when FM broadcasting in this country really was at its nadir. As an aside, both the military and prospective television broadcasters were screaming for FM's frequencies as late as 1956-57 but the FCC held fast and by that time, FM broadcasting was beginning its resurgence. 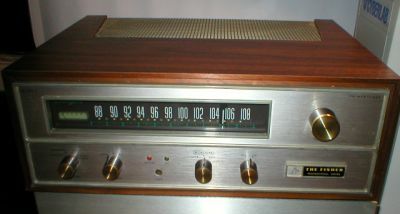 "While there's been much whoop-de-doo about the Precedent over the years, I find its performance somewhat disappointing and echoing the comments found in a comprehensive review of 'state-of-the art' FM tuners published by Consumers Research [Washington, NJ, NOT Consumers Union ('Consumer Reports') which at the time was based in Mount Vernon, NY] in 1956. The Precedent is very sensitive, of course, but its front end is easily overloaded which is why there's a multi-level attenuation control on the front panel, something also found -- but seemingly less necessary -- on the 646 series. Selectivity is also only fair, though there's no argument about the Precedent's appearance, tuning 'feel' and perhaps audio performance (though who can tell these days, with the way most FM stations overprocess their signals). "The Precedent thoughtfully included a multiplex output jack, indicating an awareness of the earliest binaural (multiplex) tests that began experimentally in 1950 at New York's WGYN/97.9. I have connected such well-known multiplex adaptors as the Scott 335 and the Fisher MPX-100 to this jack and the audio quality is surprisingly good." There's a good technical discussion of the Precedent, including the circuit changes needed to use an external MPX adapter, that begins with this post in our FMtuners group. See the main review page for Mike Zuccaro's review, photos, and the latest eBay sale price information for this legendary tuner. Our panelist Jim reports: "We have on the shelf a Rohde & Schwarz VHF Ballempfänger TYPE ESB BN 1508/2, an FM tube tuner, and a Rohde & Schwarz Stereomessodecoder TYPE MSDC BN 4193, a transistor MPX unit. This tuner doesn't fit into the transistor tuner category required for my Shootouts page, and it doesn't fit into our Modified Tuners page. By default, we're placing it here on the Tube Tuners page. This R&S combo is interesting. It's a tube tuner used with a transistor MPX, both from the same company. The R&S combo sounded somewhat tilted in the upper frequencies. There wasn't the weight and warmth I usually associate with tube tuners in the lower midrange and bass. The sound was open and lively without any sense of distortion. Many may find the sound appealing, but it wasn't my cup of tea. During commercial breaks and DJ talk, there was noticeable sibilance that didn't seem natural. All in all, an acceptable sound but I would prefer many others, both tube and transistor. I couldn't help myself and finally did some A/B listening against the L-02T. Confirming what I already knew, this R&S combo was less warm and rich in the lower midrange. The bass didn't give that same feel in the gut as the L-02T when both were turned up loud. The R&S's highs had more air, but were forward and not really to my taste. Reception was good to excellent on local stations. It's a nice BIG industrial-looking tuner and a great conversation piece. It's been on the shelf for several weeks and guests' comments are usually something like "What IS that thing?" Now can I find two strong dudes to hoist it off the top shelf? I have more tuners going bad in the garage that need to be reviewed. 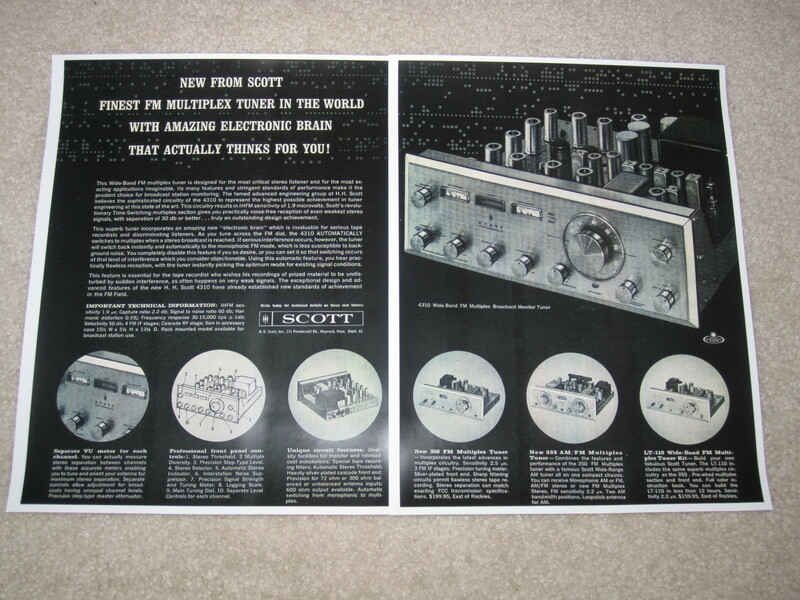 jim..."
Scott's tube tuners were almost all the 3XX series, with popular models like the 310A/B/C/D/E and 350A/B/C. The exception was their kits, which had LT in the model number - like LT-10, LT-110 and LT-111. The LT-111 was the kit version of the 370. For more information on Scott tuners, Lee Shuster's H.H. Scott website and John Byrns's site are "must-reads." Here's something to make you say "wow": A Scott 4310 sold for $2,582 on eBay in 5/05. Our panelist Bob rebuilt a Scott 335 and got to like it. "I have it hooked to the H detector output on the Kenwood 600T. It needs a LOT of caps replaced to sound good - there are 5 ceramics and 3 old Mylar in the signal path that have to go because they make it sound horrible stock. But after replacing caps, and a few other things, and a good alignment, it is a really nice sounding unit for perhaps the best of everything. One hangup, though, is that it absolutely NEEDS to be aligned to a particular tuner - the separation adjustment is a function of the incoming 19 kHz pilot level, so you need to know the tuner output level, or better, have the tuner on hand, to do the best alignment. Those that like tubes may want to grab one when convenient." Our contributor Larry has one of the Scott 350 series tuners, "a stereo unit with excellent soundstage and tonality. Cap upgrades and tube choices really make a difference here - I used Angela Audio foil in oil caps for the signal path, and primo NOS tubes all around. The 350 sounds better than the Marantz 2130 to me." Our contributor Eli has a Scott 320: "It's an AM/FM mono tuner with two AM bandwidths, a 6BR5 (EM80) tuning tube, a copper-plated subchassis for the RF section and two sets of audio outputs (low and high) along with an MPX output and stereo inputs to receive the output of an external MPX adaptor. The front panel is thin and very easily dented. Unusual for a Scott tube tuner, it has a slide rule tuning display instead of a rotary dial." John Byrns comments, "The Scott 310E uses the same RF, IF, and detector circuits as the 4310, but uses a completely different FM stereo multiplex decoder of a later more refined design than the one used in the 4310. The different multiplex decoder designs may affect the relative sonics of the two tuners. 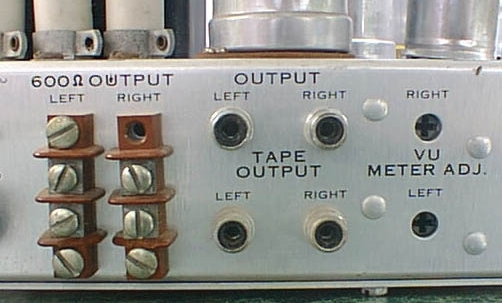 The 310E multiplex decoder was the pinnacle of Scott multiplex decoder design, and later Scott tube tuners and receivers used multiplex circuits that were cost optimized." John also describes the differences among the various models of 350 and 350x: "The original 350 was based on the monophonic 314 which had a cascode RF stage using a dual triode tube, a triode local oscillator and a pentode mixer, with two pentode IF stages and a pentode limiter driving a wide band ratio detector. There was a large open space on the 314 chassis intended for a multiplex decoder module, and the 350 was essentially a 311 with the 4-tube multiplex sub-chassis from the 335 multiplex decoder bolted into the open space on the 314 chassis. The limiter was also changed from the pentode limiter of the 314 to a 6BN6 gated beam limiter in the 350, and additional shielding was added around the IF stages. The 314's tuning eye tube was also replaced with a tuning meter in the 350. "The 6BN6 gated beam limiter used in the 350 was dropped in the 350B which went back to the original pentode limiter. 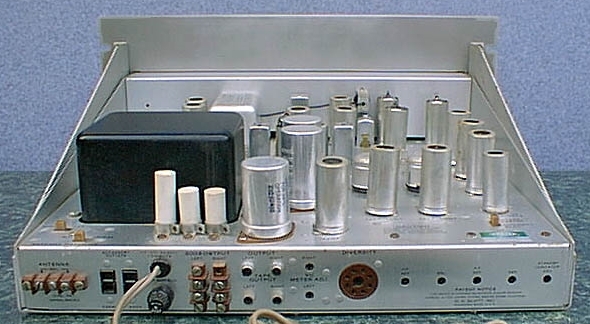 The 350B also used a higher gm 1st IF tube, although some 350Bs may have also been built with the old standby 6AU6 1st IF tube. 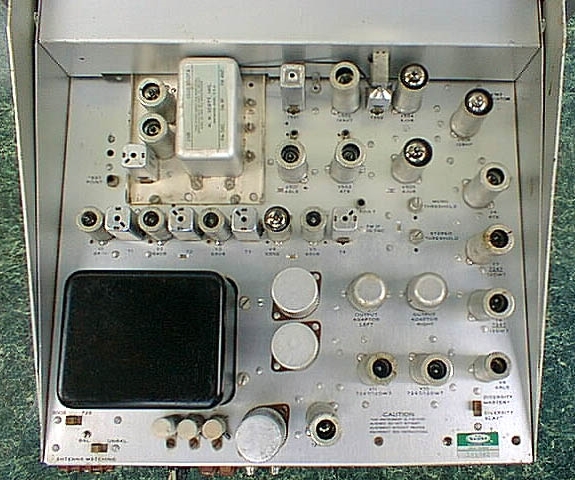 The 4-tube multiplex decoder module was replaced with a virtually identical 3-tube design that moved the audio output tube to the main tuner chassis. I assume this change in the multiplex module was made to facilitate its use in receivers where the audio stage would have been redundant. The 3-tube multiplex module differed from the 4-tube module in two ways in addition to the deletion of the audio stage. First, it added switching and some capacitors to create the 'Sonic Monitor' which was Scott's system for identifying stereo broadcasts. Second, the L/C ratio of at least one of the 19/38 kHz tank circuits was changed, presumably to improve the 38 kHz subcarrier recovery. 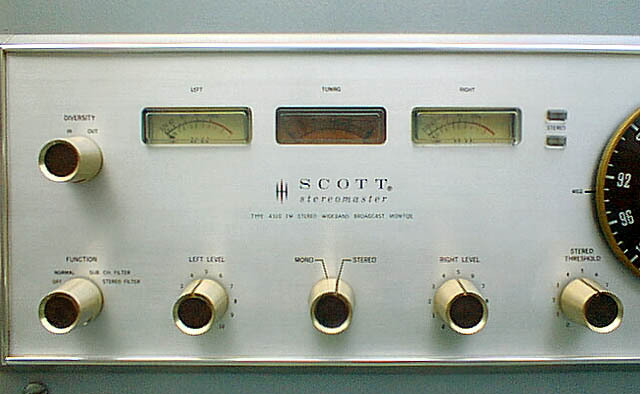 "The 350C was much like the 350B, but got the new Scott cosmetics, and the limiter was changed to a 6U8 based dual limiter with a diode limiter followed by a pentode limiter. The multiplex module was as in the 350B. 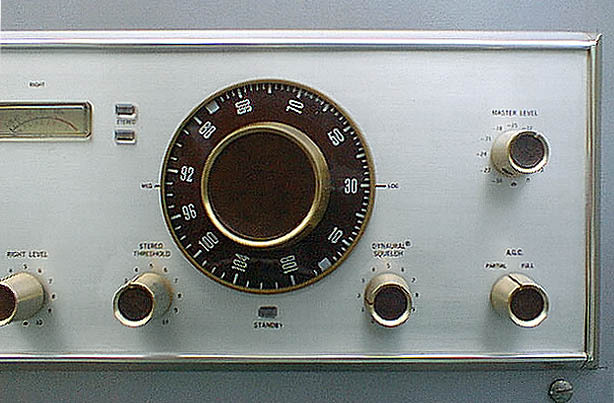 Allied radio sold a special version of the 350C with 350B cosmetics, and labeled as a 350B, although it had the new 350C limiter circuit. The 350D dropped the traditional Scott circular dial, which seemed to be a turnoff for many people, and replaced it with a standard slide rule dial to be more competitive in the market. The 350D also used a new simplified multiplex decoder module with automatic stereo/mono switching. The 350D was the only tuner in the 350 series to offer automatic stereo/mono switching." Here's John again (perhaps we need to give him his own page? ): "The LT-10 is essentially a kit version of the 314, the only two differences I know of being that the tuning 'eye' tube in the 314 was replaced by a tuning meter in the LT-10, and the original LT-10 had a brown painted face plate while the 314 had the brushed gold color. 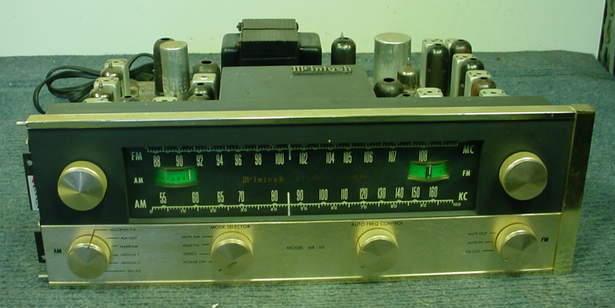 The [stereo] LT-110B was much like a kit version of the 350B. There were two circuit variations of the LT-110, the main difference being the multiplex subchassis and 'Sonic Monitor' circuit, as in the 350 vs. 350B. The IF/limiter stages of the LT-110B were unlike those of either the 350 or 350B, using three 6AU6 pentodes, the final one as the limiter, as in the original 311. I can't remember if the 'B' designation on the LT-110B refers to the circuit change, or if it only designates the later change to the new styling. Also I forgot to mention that the original 350 used a tube rectifier while the 350B, and later models used a solid state rectifier, IIRC the original LT-110 also used a tube rectifier and the LT-110 with the revised circuit and the LT-110B used solid state rectifiers. "As far as performance differences between the LT-110 and the 350-D, I haven't had any personal experience with the 350-D, but I would expect that the difference was insignificant as far as RF performance goes. I could never tell the difference performance-wise between the LT-10 and the 310-D even though the 310-D had an extra IF filter and two more tubes in the IF/limiter stages. Theory says the 310-D should have a little more selectivity, but the LT-10 was equally sensitive in my experience. The 310-D did have some extra bells and whistles, though, including a squelch circuit. There could be a difference in the sound quality of the LT-110 vs. the 350-D due to the considerable differences in the multiplex circuits the two tuners use, but as I said I have no experience with the 350-D so I don't know one way or the other. 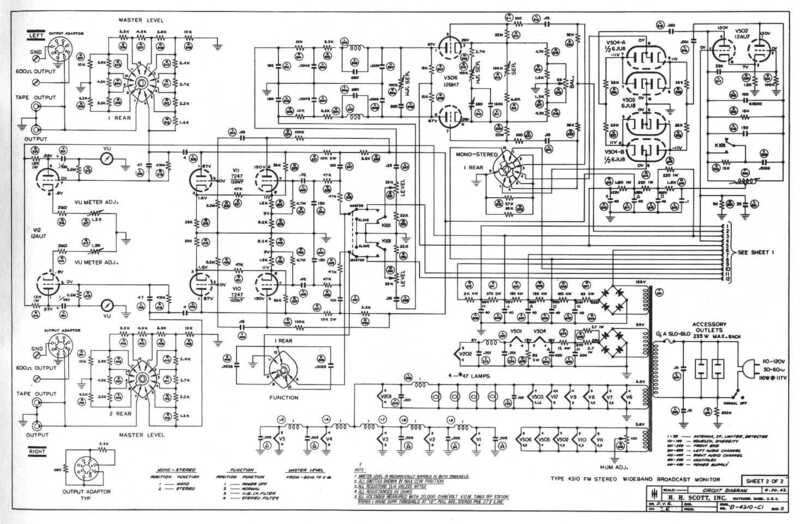 I do prefer the sound of the multiplex circuit in the 310-E to that of the 350(B,C), but the 310-E multiplex is a more sophisticated multiplex decoder design than either the 350(B,C) or the 350-D design. My ideal Scott tuner would be an LT-10 with the 310-E multiplex circuit in it. The 350-D seems to be a somewhat rare tuner, I assume because the 312 came out about the same time as the 350-D, so why would anyone buy an old technology tuner like the 350-D when they could have a nice modern transistorized 312, unless saving a few dollars was important." 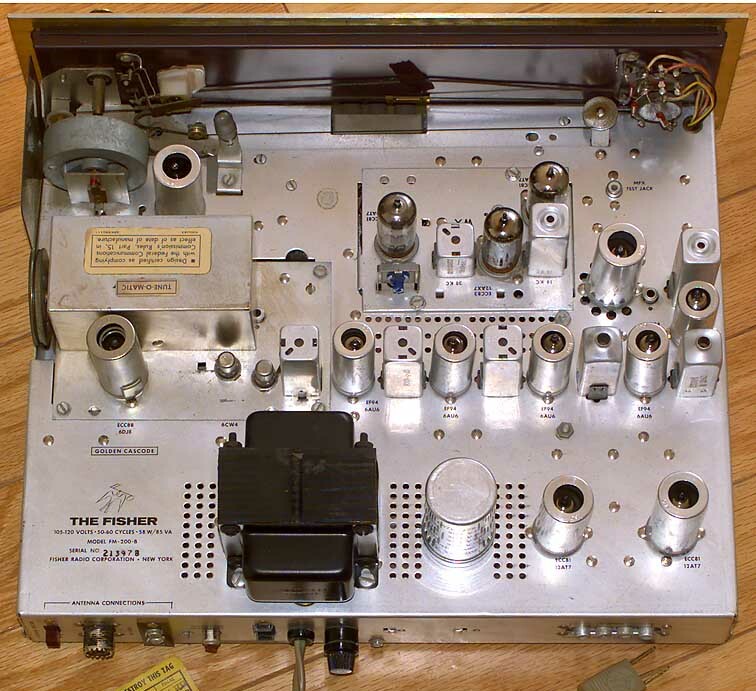 More from John: "I was able to locate a schematic for the original no suffix Scott 330 AM/FM tuner on the web, and it has a bypass capacitor across the cathode resistor of the first FM IF stage. 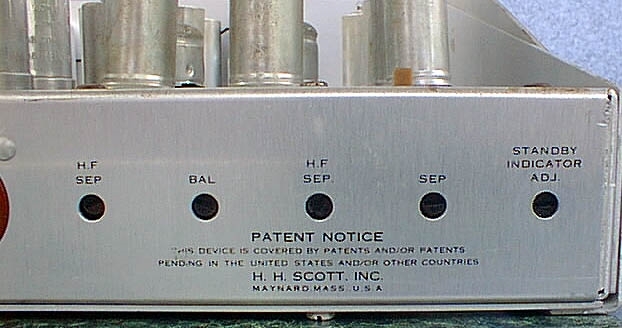 My speculation is that this bypass capacitor was part of Scott's original first generation design and was then deleted from the later revised follow-on models. The cathode bypass capacitor was only used in the very early models and hence is infrequently seen." Many Sherwood schematics and service manuals may be found here. Here is a link to the definitive web page about Sherwood products. Our panelist David "A" says, "I always found the best of the Sherwood S-3000 series were more musical when modded than any other tube tuners and they sell dirt cheap (until the word gets out). But be advised that you really have to go through them - don't expect to plug one in and be amazed unless someone else did the work previously!" Our contributor Brian reports, "Since I just aligned my Sherwood S-2000 tuner, I thought I would measure its selectivity just for fun. This tuner has three double-tuned IF transformers, then a single-tuned IF coil, and finally the discriminator. I don't know the standard way of testing selectivity, but I think the method I used is close. Here are the results: [About 39-46 dB alternate channel and 0-6 dB adjacent channel. - Editor] Cruising around the dial with loads of signals, many on adjacent channels, this tuner seems quite selective. I had no trouble separating stations. I was surprised the numbers came out so low." Brian also retubed and aligned an S-3000V and "was really impressed with it. I just ran it on a little indoor folded dipole at the bench but got tons of full-quieting signals in stereo. It sounded really good." Our panelist Bob adds, "The S-2000 is the AM/FM tuner, and as far as I know has the same FM section as the FM only S-3000. The S-3000 is by far the most selective of all the Sherwood models. The later S-3000II/III were quite wide in comparison." Bob explains the minor differences between the S-3000II and S-3000III: "There was no capability to install a stereo decoder on the II, it had an MPX out jack instead. Note, that is somewhat of a drawback on the III - there is no stock MPX out jack, so you were supposed to add the onboard stereo kit. Technical types can easily add the jack, though, to the III. Also the II had the older-style vertical signal meter tube, same as the S-3000, but the III used the newer horizontal signal meter tube. There are also minor differences in the circuits, but in general the II and III are close, circuit-wise. Both had fairly wide IF filters compared to the first model, the S-3000, likely for lower distortion in stereo. This makes them poor for selectivity, especially compared to modern tuners with selectable wide/narrow IF filters." Here's a follow-up from Bob: "My original comments on the S-3000 series selectivity were made after testing those Sherwoods with an HP analyzer which can sweep and display the IF filter shape. It was quite clear that the S-3000 has a more narrow filter than the 3000II and 3000III. The 3000III was the first unit designed after the stereo standard was approved, and has very wide IF filters. Some came with onboard stereo decoders. I never did test the 3000IV, and don't own the 3000V, but I would be surprised if they were as narrow as the 3000. Having said that, anyone who ever studied the Sherwoods will see that there were running changes almost constantly in the circuits. So if you own two of the same model, chances are good that the circuits will be slightly different, and likely not exactly match the schematic. There are (or were) sources for the exact schematic based on serial number range, though, from the archives in Chicago. These are handled by Martroy Electronics Inc, 6259 South Kedzie Avenue, Chicago, IL 60629, phone: (773) 776-7000, email: Martroy11@comcast.net." Our contributor Eli notes, "Sherwood made many undocumented changes during production and you can't assume that two tuners will be the same just because they have the same model number. For example, I have two copies of the S-2000 and one of them has no tuning tube or meter at all while the other has a tuning tube." Our contributor Robert adds some details regarding the S-3000III: "Earlier examples used a 6V4 tube rectifier, which tube was placed at the rear of the chassis between the slide switch and the multiplex decoder. Later-built units have solid-state rectification. The optional multiplex decoder would go on a separate plate, attached to the main chassis by four screws, having the plug-in umbilical that plugs in at the far right as viewed from the rear."